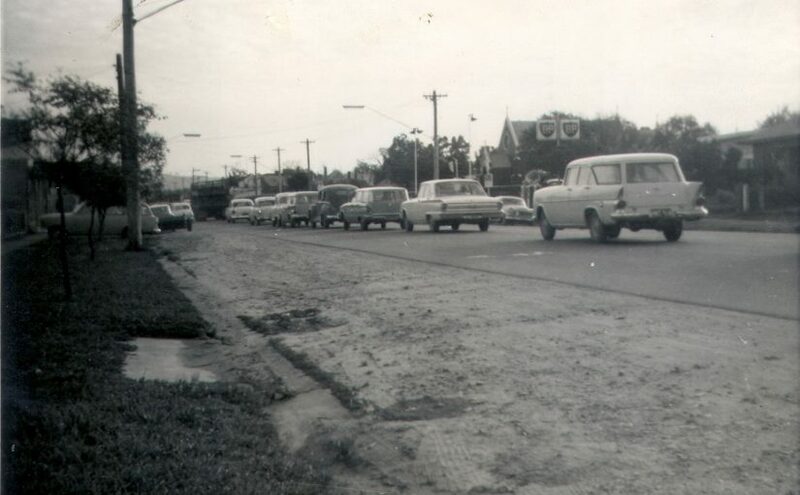 Wodonga in 1963 as reported in Wodonga and District Express, a weekly newspaper which cost three pence or £1 annual subscription. The year was welcomed in with a Mardi Gras which closed off a section of High Street. The Bank of New South Wales was advertising that teenagers could have a cheque account which would give them a permanent record of their income and expenditure and give them prestige. Police, both uniformed and plain clothed had been stationed at the swimming pool, for several hours at a time, checking on hoodlum activities with high-powered binoculars. The exercise was considered a success. Tenders were for called by the Housing Commission for construction of 10 timber homes. The old High School next to the Post Office in High Street was taking enrolments for forms 1 and 2 as the newly established Wodonga Technical School. Hundreds of eager youngsters queued to enrol for Learn-to-Swim classes at the pool. 95 girls and 200 boys enrolled on the first morning with more to come through the week. The completion of the sewerage works had stalled as the two main pumps had not yet arrived. One of the most important connections being the swimming pool used by upward of 1000 adults and children daily would not be ready before the end of the swimming season. The Wodonga Show Secretary reported that he sent out 1500 schedules to exhibitors and other interested people. Victorian Railways reported they had placed a 35,000 gallon water train in Flinders Street yards ready to assist in any bush fire emergency. Wodonga residents would no longer have to travel to the cities with the arrival of a physiotherapist to work at Wodonga Hospital. The February meeting of CWA was attended by 45 members. North Eastern Dairy purchased Holdenson & Nielson butter and milk factory. None of the 38 employees would be affected. In March the usual eight page newspaper was enlarged by a twelve page supplement celebrating the upcoming Wodonga Show. The publication was well supported by advertising of local business, most of which would have a stand at the Show.